Just three months into the new year and already, the United States has more cases of measles than all the 12 months of 2018 combined. The Centers for Disease Control reported Monday there had been 387 measles cases between January 1 and March 28, 2019. In 2014, the year that now holds first place, a shocking 667 measles cases were reported. The numbers are preliminary, and may change. The high number of measles cases so far this year is due to outbreaks in a handful of states, including California, New York, and Washington, CBS News reported. "These outbreaks are linked to travelers who brought measles back from other countries such as Israel, Ukraine, and the Philippines, where large measles outbreaks are occurring", the health agency said, adding, "Measles is still common in many parts of the world including some countries in Europe, Asia, the Pacific, and Africa". As measles cases in the USA continue to balloon, more states are recording outbreaks. By comparison, in all of 2018, there were 372 confirmed measles cases in the U.S. The vaccine is completely safe and effective with a single dose being about 93 percent effective in measles prevention and two doses being 97 percent effective. "Measles is so contagious that if one person has it, up to 90% of the people close to that person who are not immune will also become infected", the CDC has said. Measles is a highly contagious viral disease characterized by fever, cough, runny nose, and red, watery eyes followed by a rash that can spread from the head to the trunk to the lower extremities. However, a very small fraction of people get much sicker, and can suffer complications like pneumonia and swelling of the brain. Prior to the vaccine, measles caused approximately 450 to 500 deaths each year in the United States. There have been three measles-related deaths reported in the USA since 2000, including two in 2003 and one in 2015. 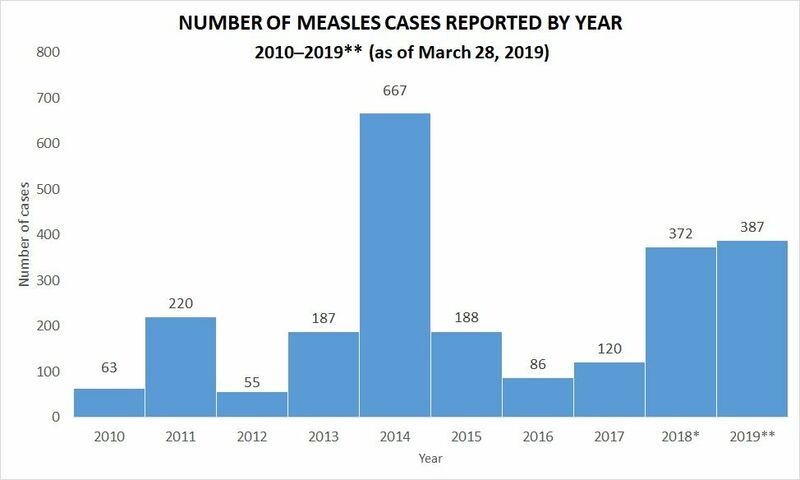 As we enter the second quarter of 2019, more Americans have come out in red splotches than in any other year since measles was eradicated - with the exception of 2014, when a massive outbreak among unvaccinated Amish communities in OH resulted in a huge annual total of 667. "Measles, mumps, and rubella (MMR) vaccine provides long-lasting protection against measles". "Ensuring your children have had two doses of MMR vaccine will give them the best protection here and when travelling overseas". "The biggest are two outbreaks in New York", Dr. Manisha Patel of the Centers for Disease Control and Prevention, which tracks reported cases, told Newsweek. They're still led by the same guy - head coach Tom Izzo , who is determined to win the second National Championship of his career. Auburn star Jared Harper and some of his teammates are dealing with an illness that he hopes will be better by Saturday night. Those who want to purchase multiple subscriptions now to extend their current renewal date have a few months to do so. In other words, you still have time to grab a subscription at the regular price before the changes are implemented. Diets lacking in healthy food are responsible for more deaths across the globe than smoking, a major new study has concluded. The study reports that in 2017, 11 million deaths were attributable to dietary risk factors. A person who attended that meeting told the Journal that the president said he told Powell, "I guess I'm stuck with you". The President stepped up criticism of Powell and the Federal Reserve after a series of interest rate hikes in 2018. It debuted simultaneously on Billboard's R&B/hip-hop and country charts , then was quickly removed from the latter. The reason? The song "did not embrace enough elements of today's country music to chart in its current version". This morning, a Downing Street source said May is to write to Tusk today with the UK's request for a further delay to Brexit. If the talks don't work, May plans a series of votes in Parliament to see if a majority-backed plan can emerge. Trump invoked national emergency powers in February, having tried to get wall funding from Congress without success. Leaders of the three countries signed the USMCA in November after more than a year of negotiations. After last year's injury-shorted camp, he'll have another shot to impress the Chiefs and make the roster this time around. He signed with the Chiefs later that season and was a member of the practice squad before being called up for one game. Brexit: How Would the Plastics Industry Have Voted 'Indicatively'? Second, the "Norwegian" option is for Britain's membership of the European free trade Association and European economic area. That instability increases the chance of an early British election, which could rearrange Parliament and break the deadlock. Tom Brady and Bill Belichick won't be around forever, so it's important they can hit at least one home run this year. The Patriots are of course an aging team, and the young talent on the roster is few and far between.